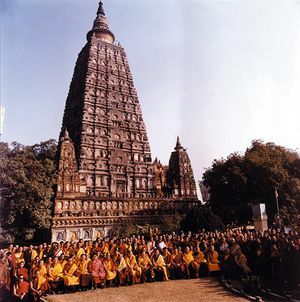 Nyingmapa masters in front of the Mahabodhi stupa at the Mönlam Chenmo prayer festival, Bodhgaya, 1996. Bodhgaya (Skt. bodh gayā, Tib. རྡོ་རྗེ་གདན་, Wyl. rdo rje gdan), near the city of Gaya in the Indian state of Bihar, is the village that was built around the Vajra Seat. By the bodhi tree near the Vajrasana is the main stupa, which is called Mahabodhi, surrounded by numerous smaller chaityas. At the time of the Muslim invasions in the 13th century the site was abandoned to the jungle, with the result that it survived the massive destruction which befell other Buddhist sites and is preserved today. The Archaeological Museum also houses many relics. The site is flooded with Tibetans each year from November to February, when, unlike during the rest of the year, it is not unbearably hot. Since 1987, the Nyingma Mönlam Chenmo has been held in Bodhgaya every year during the first ten days of the 12th Tibetan month. Chak Lotsawa spent eleven years in Magadha from 1232 to 1241, mainly in Bodhgaya and Nalanda, as the sacred sites were in the process of being destroyed. His story is well known, especially through Roerich's translation of his biography, but Vitali (2010) has described how at least seven other Tibetan masters also visited Bodhgaya during the same period. Chomden Rigpé Raldri (1228-1305) composed a guide to Bodhgaya, but it is unclear whether he actually visited the site. Ahir, D. C. Buddha Gaya through the Ages. Delhi: Sri Satguru, 1994. Allen, Charkes. The Buddha and the Sahibs. John Murray, 2002. Barua, Benimadhab. Gaya and Buddha-Gaya, Vol. 1: Early History of the Holy Land (1931). Varanasi, India: Bhartiya, 1975. Barua, Dipak Kumar. Buddha Gaya Temple: Its History. Buddha Gaya, India: Buddha Gaya Temple Management Committee,1975. Second revised edition, 1981. Bhattacharyya, Tarapada. The Bodhgaya Temple. Calcutta:Firma K. L. Mukhopadhyah, 1966. Leoshko, Janice, ed. Bodhgaya: The Site of Enlightenment. Bombay: Marg, 1988. Vitali, Roberto. 'In the Presence of the "Diamond Throne": Tibetans at rDo rje gdan (Last Quarter of the 12th Century to Year 1300)' in Tibet Journal: The Earth Ox Papers, Ed. Roberto Vitali, 2010. This page was last edited on 21 August 2017, at 01:50.